The sequel to the Read, Write & Type, Wordy Qwerty – Foundations for Reading and Writing Fluency, takes 7-9 year olds through the next steps of reading and writing fluency, and picks up where our award-winning software, the Read, Write & Type leaves off. After successfully completing Read, Write & Type, most 6-7 year olds are able to write any word they can say. But they may not spell them all correctly, because they need to know a bit more about spelling conventions and about how words are constructed in English. This is where Wordy Qwerty comes in. In 20 consecutive lessons, woven together with fun-to-play games and delightful songs that will stay in their heads (and an audio CD they can play in the car or on their audio CD player). Some sounds can be represented in several different ways. Most words follow about 20 easy spelling rules. There are many word families, (words that sound the same, or rhyme). By changing the first letter(s), you can make hundreds of words. Some words are “outlaws”. They don’t follow the rules. They must be recognized quickly and automatically. Writing to dictation develops vocabulary, comprehension and fluency as well as spelling skills. Reading (and filling in missing words) develops vocabulary, comprehension, and fluency skills. Patterns: Children generate two lists of words by typing the names of pictures and sorting the words by a given characteristic. They are directed to notice the patterns,” or spelling rules, by comparing the two lists. If they can’t sound out the words or spell them correctly, the Helping Hands will assist them. Qwerty and Midi talk about the differences between the two lists and derive the 20 spelling rules which then are woven into the lyrics of delightful songs. Karaoke: Rhymes and songs are memorable and fun. There is a catchy song about each of the 20 spelling rules. Children read the lyrics on the screen and can sing along if they want. Often the lyrics contain examples of the words that reflect the spelling rule. 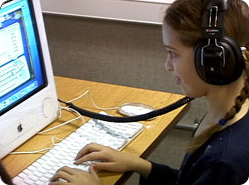 Children are motivated to read the words while the song is playing, or while they are singing it themselves. Recycler: Lots of words that rhyme can be made just by changing the first letter or letters of the word. Some words sound the same, or rhyme, but use a different combination of letters to represent the same sound. In this game, chidren learn different vowel combinations that can make the long vowel sound. They watch the RECYCLER drum whirl as it changes the first letter(s) of two rhyming words. They learn to quickly distinguish real words from non-words. The non-words are vacuumed away. Players that score less than 90% on the first try are asked to study the list of real words. If any are not familiar, they can click on the word and hear it used in a sentence. Then they are asked to play the game again. Pop-a-Wordzz; “Outlaw” words are best memorized by learning to recognize them quickly. In this arcade-type game, children find words in a 4 word phrase as each word appears briefly, along with non-target words, in a cluster of colorful balloons. As children click on the correct balloons, they “pop”. The faster they recognize the correct words, the more points they make. Write Stories: In these cleverly illustrated 8-line rhymes, children hear and see the first line, and have to type out the second line after it is dictated. They can see and hear the dictated line as often as they need, but get more points if they remember the sentence and try to spell the words correctly. These little stories are full of words that require using the spelling rule just presented. Read Stories: Here are some short, engaging stories that develop comprehension, vocabulary, and fluency. Every so often, there is a word missing, and children have to choose among three possible words, the word that best fits the meaning of the sentence. These stories also include words that utilize the spelling rule, or the “outlaw” words learned in that lesson. Talking Fingers is proud to be an iParenting Media Award Winner for both Wordy Qwerty and the Read, Write & Type. Read the 2011 reviews of Wordy Qwerty, on Homeschool Blogger. 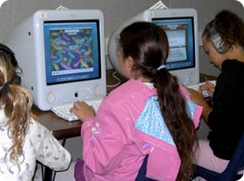 Today in the computer lab I saw five first graders doing Wordy Qwerty. Yes, you heard right, first graders!!!! !The teacher has a rule that after children go through the Read, Write & Type program three times they can start on Wordy Qwerty. The lab instructor does not help the kids one bit. The kids figure Wordy Qwerty out all by themselves.I saw two kids jumping around their chairs, singing out loud to the song of a particular sound. They were really into it. They were very comfortable doing Wordy Qwerty...no problems. They didn't ask me any questions, they just kept going and going and going, having a ball.I simply can't get over how exuberant, enthusiastic and totally into learning each of these five first graders were. It was spectacular. It was unbelievable. It was marvelous. These children are going to be successful in anything they do. Their brains have been wired to learn and think. And on a "having fun scale" of 1 to 10, the kids were a 10+!!! "The students immediately recognized that the program was made by the same people as the Read, Write and Type, a program they had used in first grade. The program needed little or no introduction, as all instructions were given to the students in the lessons. The student reaction to the program was, 'This is really fun!' They couldn't wait to get to the next activity." 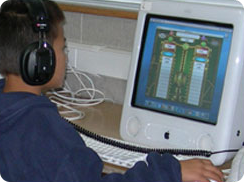 "Wordy Qwerty quickly engaged the students and kept their attention. It was darling when they were spontaneously singing along with the program, not realizing that they were singing out loud. The program was appropriate for grade level language arts."